Greg Mullins, the Dean of the Library & Media Services speaks about our library’s role as the hub of academic inquiry, art, media, and community. Gallery exhibitions elevate the visual arts across the curriculum and connect the arts with the entire community. Your contribution will support inspiring, thought-provoking exhibitions that complement Evergreen’s interdisciplinary curriculum and reverberate far beyond the classroom. Evergreen Gallery features art from diverse cultures, perspectives, and artistic concerns, including a May/June exhibition of work by select graduating art students. 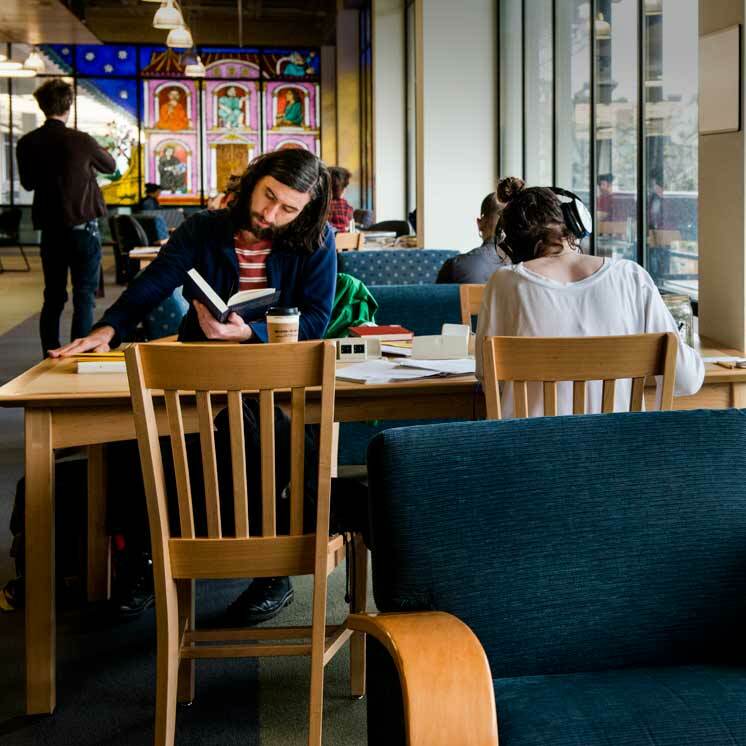 Students enjoy a mix of individual and group spaces in the Daniel J. Evans Library. Your gift to this fund provides flexible support to the Daniel J Evans library. Through this fund, the Dean is able to host readings and art gallery talks, to expand the library collection, to promote information literacy and media literacy, and to support professional development that keeps our librarians on top of emerging trends in information technology. Robert McChesney speaks on money, media and America - Library Underground, November 2013. Your gift to this endowed fund will help Evergreen draw nationally recognized authors to give public lectures. The Reading Series aims to create cross-campus learning opportunities across the disciplines. This fund may also be used for material infrastructure to support presentations in the library. Students conceptualize, use, and produce projects using state-of-the-art equipment and technology in our CCAM studio. access to state-of-the-art technology in our CCAM. This endowment supports future equipment purchases and will ensure the Center remains at the cutting edge of digital media. The Library is open to the Evergreen community and the public. Our policies and procedures have been designed to ensure equitable access for all members. Review the library’s policies. Evergreen Library and Media Services is dedicated to the best possible service to the interdisciplinary programs, students, staff, and faculty of The Evergreen State College. We continually strive to seek new and innovative ways to provide information in all possible formats in order to meet the ever-changing research and academic needs of our patrons, provide quality instruction in the use of the materials available through the Library, and serve as a repository of unique titles and collections for our patrons, our community, and the Pacific Northwest region. The Library houses a collection of over three-quarters of a million print and media items and provides more than 35,000 journal titles, largely in digital format. The Library also maintains special collections of rare books and archival materials. Media Services offers students, faculty, and staff across the curriculum access to media equipment, production facilities, production services and media instruction. Library and Media Services resides within the Information Technology Wing of the Library building. Save time and visit our library floor plan maps to find where you need to go.